04 Feb 2019 --- Plant-based alternatives to animal proteins and crop gene editing tools are among the most promising areas for food technology investment right now, but the highly exciting field of cellular agriculture may be just too far down the horizon for traditional venture capital investors. This is according to Niccolo Manzoni, Co-Founder and Managing Partner of Five Seasons Ventures, a Paris-based venture capital firm focusing on the food and agricultural technology space. He also singled out pet food and personalized nutrition as platforms that the investment company, with a fund size of more than €75 million, is looking towards. Click to EnlargeNiccolo Manzoni, Co-Founder and Managing Partner of Five Seasons VenturesRelatively speaking, the most simple platform is plant-based alternatives, says Manzoni, who has been investing in Food Tech since 2014, and created and managed a portfolio of 10 high-profile Food Tech companies, including Impossible Foods, Clara Foods, Beyond Meat, JUST, Perfect Day and Clear Labs, as part of a leading European family office. Click to EnlargeThrough a leading European family office, Manzoni previously invested in US-based in vitro meat innovator Memphis Meats, where he gained significant exposure to this space. “Because of the time horizons, it doesn’t lend itself to the timeline of a traditional venture capital fund, which is usually 10 years,” he explains. “Having said that, we are seeing a number of funds who are taking an interest in this space. Rounds are happening and there is definitely an investable interest. This is because of the potential for this industry to really turn things upside down,” he adds. Click to Enlarge“Tropic Biosciences is applying gene editing and CRISPR technology to tropical crops to start with, specifically bananas and coffee,” Manzoni explains. “They are working on specific traits which make this product either overcome some specific disease, which is maybe affecting some of these crops, or creating some consumer traits which make the products either tastier or better for the consumers or making some traits which are closer to the producers or processors of coffee,” he says. This could, for example, include lengthening the shelf-life of these products. 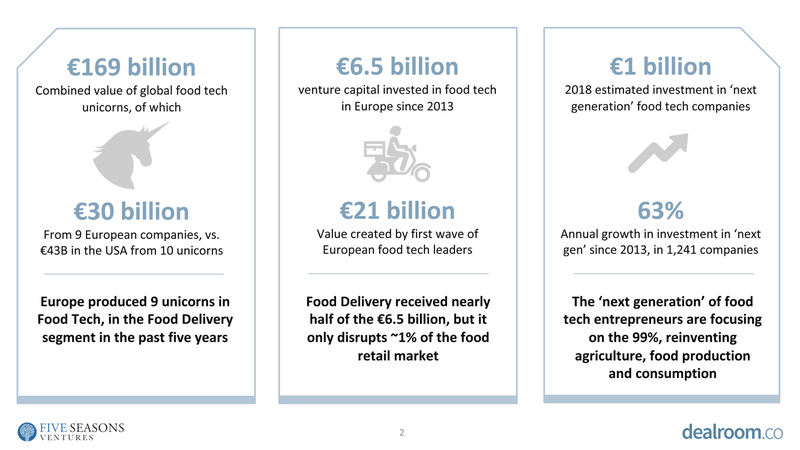 A recent report that Five Seasons authored with DealRoom on The State of European Food Tech 2018 found that an estimated investment of €1 billion was made in “next generation” food tech companies in 2018. 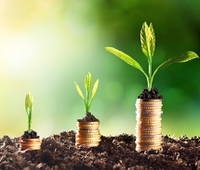 There was 63 percent annual growth in investment in “next gen” since 2013, in 1,241 companies. 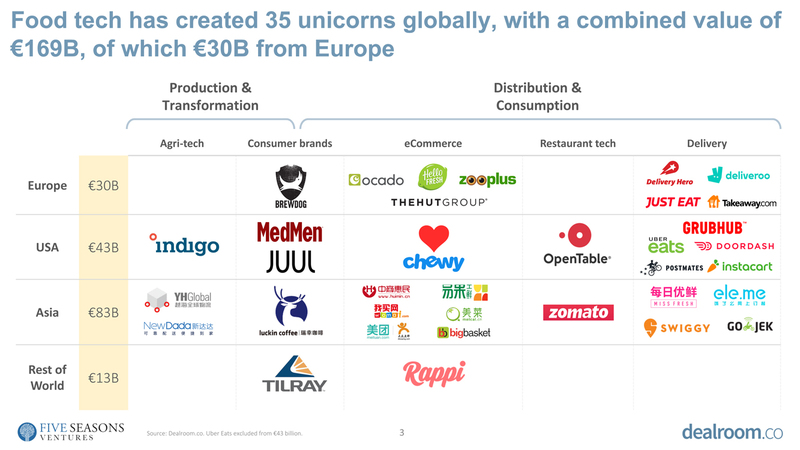 Europe produced 9 unicorns (companies with a value of €1bn turnover or more) in Food Tech, in the Food Delivery segment in the past five years, for example, according to the report. You can download it here. So what else will Five Seasons Ventures be investing in this year and beyond? “We have a few themes that we are going after,” Manzoni says. “We think that in the food tech space, there are a few areas where there is a combination of factors making it investable. Also, there are many start-ups making it exciting,” he notes. One of them is pet food. “This is an exciting area where there hasn’t been a huge amount of innovation in recent years. Now we are seeing interesting early stage companies, using a combination of new product formulations, personalized pet food, direct-to-consumer distribution models and a number of other innovations,” Manzoni explains. Secondly, Five Seasons is also looking closely into personalized nutrition as a theme. “This is the ‘holy grail’ of the food industry. It is about giving a consumer exactly what they need from a nutritional standpoint to feel well and to lead a positive life. In that sense, we are seeing some companies with several business models that can deliver either personalized supplements to consumers, or even personalized meals and nutrition solutions,” he concludes. 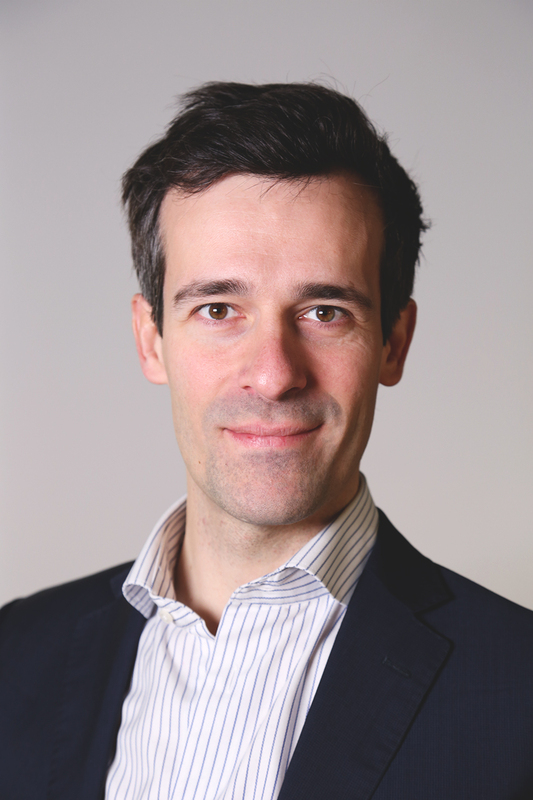 A detailed interview with Niccolo Manzoni, Co-Founder and Managing Partner of Five Seasons Ventures, including advice for food and agri-technology start-ups will appear in the February issue of Innova Food & Beverage Innovation.